Tomorrow, December 6, your Xbox will transform from a gaming console into a full-blown entertainment center. Microsoft has announced the details of its upcoming overhaul of Xbox Live, which will give users access to dozens of new entertainment services through their dashboard. The update includes live TV, as well as the ability to control their new “all-in-one” entertainment hub simply by speaking via Kinect’s motion- and voice-control functionality, among other new features. The Xbox Live update will begin rolling out on Tuesday. Resembling the tile design of Windows Phone 7.5 Metro, as well as the upcoming Windows 8 operating system, the dashboard update is the most major overhaul of Xbox Live in the past five years. Microsoft has billed the update as the “future of TV,” and from the list of new features, they may just be right. • Metro design: New tile design that makes it easier to navigate through the massively increase number of media options. 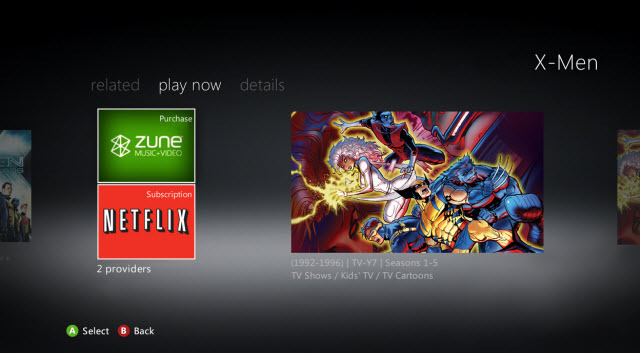 • Improved Kinect voice control: Kinect voice search using Bing (Just say: “Xbox, Bing X-Men,” and all content related to “X-Men,” from both the Web and your Xbox 360 console, will show up as a selectable option.) Every app is now Kinect-enabled. • Kinect motion control: Swipe through and select content on the dashboard simply using Kinect motion controls. • Live TV: Users will now have access to live TV from a number of providers, including Verizon FiOS and AT&T U-Verse. • Beacons: Let users know you’re up for some multiplayer action at a specific time by posting messages to Xbox Live and Facebook. Friends can then join in on the gameplay straight from the beacon. • Cloud storage: Users can now save their games directly to Microsoft’s cloud, rather than to the Xbox 360 hard drive, making it possible to load a saved game from any Xbox 360. • Entertainment apps: Microsoft is adding 40 new entertainment apps globally. The release of new apps will start tomorrow, with many more to follow in the upcoming months. • Xbox Companion: Also out on Tuesday is a free app for Windows Phone devices, which allows users to control their Xbox Live dashboard directly from their phone.